To find a recognisable orchid hybrid in the wild is exciting, but they are sometimes difficult to identify accurately because, even in relatively small groups of hybrids with the same two parent species, there can be considerable variation in the shape, size, and most confusing of all, lip pattern and form of the flowers. Monkey Orchids and Lady Orchids are both very rare in the UK and so, whilst orchid hybrids are not uncommon in the wild, it is extremely uncommon that hybrids between two such rare species should occur in Britain. In other parts of Europe where both species are more common, the occurence of this hybrid is more frequent. The plants shown on this page were photographed at Hartslock Nature Reserve in the Chilterns, where a colony of Monkey Orchids was well known. It was not until 1997 that an unusual leaf rosette was discovered at the site which, when it finally flowered in 2002, proved to be a Lady Orchid. In the following years several more Lady Orchid leaf rosettes were observed and were joined by several other leat rosettes which displayed further differences. 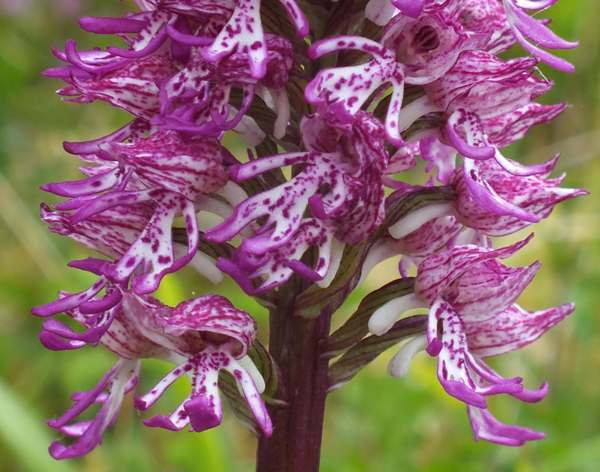 In 2006 a flower appeared which was very different from the Lady Orchid and the Monkey Orchids on the site but revealed the visible characteristics of both parents in varying degrees - the first hybrids between the two species ever to be found in the UK. Above: a group of hybrids between Lady Orchid Orchis purpurea and Monkey Orchid Orchis simia sometimes referred to as the Lankey Orchids. In the centre is the Lady Orchid and it is surrounded by hybrids which, on close inspection, are very variable. There is a small group of Monkey Orchids nearby. They flower, on average, around five days after the Lady Orchids and about a week before the majority of the Monkey Orchids. The hybrids (in common with most orchid hybrids) are much larger and more vigorous than the Monkey Orchids plants and rather closer to the stature and form of a Lady Orchid. The flowers open from the bottom of the infloresence and upwards rather than the 'top-down' flowering habit of Monkey Orchids. The flower lip is similar to that of the Monkey Orchid but with thicker 'legs', while the flower hood is deep purple and strongly spotted. The plant leaves are strong like those of the Lady Orchid but are somewhat greyish-green like the leaves of the Monkey Orchids. Above: 1 - Monkey Orchid with its pale hood and thin curly 'legs'. 2 - The hybrid beween the two species. 3 - Lady Orchid flower. 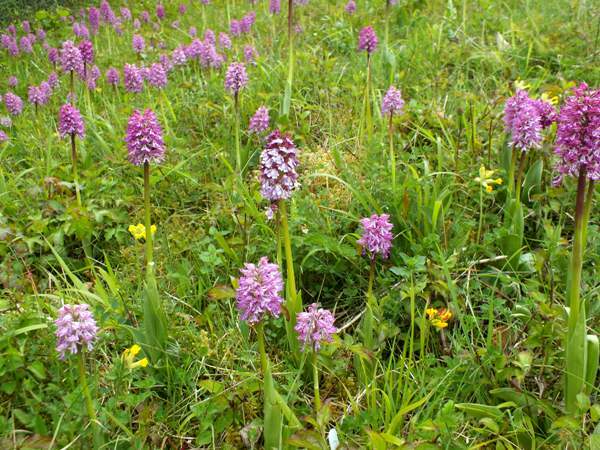 DNA analysis of the Hartslock Lady Orchids has revealed that their closest relatives are plants found in the south of France, leading to the conclusion that the Lady Orchid was introduced, either by accident or deliberately.